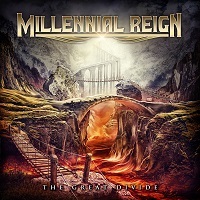 “The Great Divide” is the third record of American power metal band MILLENNIAL REIGN in six years. The album features ten anthems and three new members: Travis Wills on vocals, Steve Nichols on drums, and Neil Bertrand on the bass. They are joined by founding member and guitarist Dave Harvey. Since the release of their 2015 album “Carry the Fire”, the band had toured with Stryper on their 30th anniversary tour and supported acts like SONATA ARCTICA, LEAVE's EYES, THEOCRACY, OMNIUM GATHERUM, HAMMERFALL, and Joe Lynn Turner. The album begins with a prelude in “The Genesis”, a tension-building instrumental with a theatrical approach of drumming and orchestrations, which will transition quickly to the anthemic, enigmatic and heavy song “Break the Tide”. The song is mainly driven by its strong riffs and Travis’ powerful and emotional singing especially in that catchy chorus. Dave’s work in the guitar solo is excellent as well. It starts with a slower tempo and steadily transitioning to mid-tempo approach of melodies. Meanwhile, they go aggressive and emotional with “More Than Scars”. It begins with the relentless combo of high-pitch guitars and drums in the intro, and then complemented with the heavy classic sounding riffs. Travis’ raw voice and high notes is a true thing of beauty. It is so powerful and full of emotions, giving the listener the exact mood of the song. The song’s tune is so anthemic and catchy as well, as exactly as it should be. The style applied here is very much like Saint Deamon’s power metal approach. Power ballads are also part of MILLENNIAL REIGN’s arsenal, as featured in “In Your Silence”. The guitar intro sounds like any scorpions classic ballad, which is so calming and chilling. The main attraction in the song is once again Travis’ singing which is simply amazing. His voice is the perfect sound the band needs. He blends very well with their overall musicality. Another feature is the guitar solo, a very emotionally powerful solo. Imagine the solo of DREAM THEATER’s “The Spirit Carries On”, twice the speed, and you get exactly what I’m saying. The song is an outstanding display of every member’s talent and versatility. The title track “The Great Divide” puts the icing on the cake for a very strong and graceful finish to the album. The song is epic in every aspect – the singing, the riffs, the atmosphere, and the lyrics. The song is on mid-tempo, with a very melodic approach and has a one-minute long breathtaking solo. That’s what you call saving the best for last. To conclude this review, the album is an excellent release considering that three members in this four-piece band are new insertions. Travis Wills is a jackpot for this band – his singing is exceptional, teaming up with Dave Harvey’s already proven mastery and flexibility on the guitars. The album is perfect for fans of QUEENSRYCHE, CRIMSON GLORY, STRYPER, and THEOCRCY. But it surely deserves a spot in your power metal collection even if you are not a fan of the aforementioned bands. This is an American power metal album at its finest.